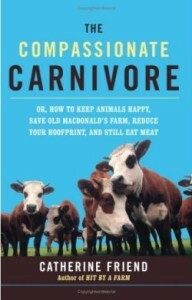 The Compassionate Carnivore: Or, How to Keep Animals Happy, Save Old MacDonald’s Farm, Reduce Your Hoofprint, and Still Eat Meat follows a group of popular books on “conscientious eating”, like Michael Pollan’s In Defense of Food and Barbara Kingsolver’s Animal, Vegetable, Miracle. This is a book about eating in a healthy, sustainable way, but it specifically concentrates on eating meat that comes from humanely-raised animals. selling their meat. It does not allow most farmers to treat animals humanely and farm in a sustainable way, if they want to make a profit. She hopes to convince the reader to invest more in small, local, humane farmers, thus shifting the marketplace. Friend points out that most people today have no connection to the animals that they eat. We pick up our meat from a fast food counter or the freezer section of the grocery store and we think that meat comes in a neat, clean little package. We forget that our food comes from a living, feeling animal. In other words, she doesn’t want us to stop eating meat. She convinced me that as a consumer I have a choice. If I worry about the treatment of animals, the answer is to spend my money only on those brands and products that treat animals humanely. Thankfully, this book provides the tools that consumers need to make conscientious food choices. It helps to understand what the terminology of food production means. For example, in my grocery store I can buy eggs that are organic, eggs from cage-free chickens, or eggs from chickens not given any antibiotics. I may have to choose between local products, which reduce the carbon footprint, and humanely-treated organic products. It’s complicated; and there is very little regulation so products can mostly say what they want. Friend’s suggestions are practical and not hard to implement. I have a farmers’ market in my neighborhood that sells meat from local farmers. Most cities have stores and restaurants that specialize in organic and local meat. I will have to spend more, but if this is something that matters to me, I should spend more. Friend recognizes that many people aren’t able to spend more on their food. But she’s convinced me that as someone who has a little more to spend, I have a responsibility to make that choice. Fortunately I benefit health-wise as well. I highly recommend this book to anyone who wants to read about food from a farmer’s perspective, and who knows they aren’t going to give up eating meat, but still want to do what’s right for animals, our health, and our environment. 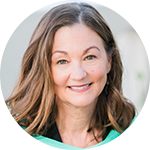 Thanks, Deborah for adding this review to the collection of great nonfiction books – this one living true when it comes to food, our health and the world! This review is by professional book reviewer Deborah Spitz. She can also found reviewing books at The Book Stop.